We thought it would be nice to start the week with photos from last week’s visit to Lane’s End. 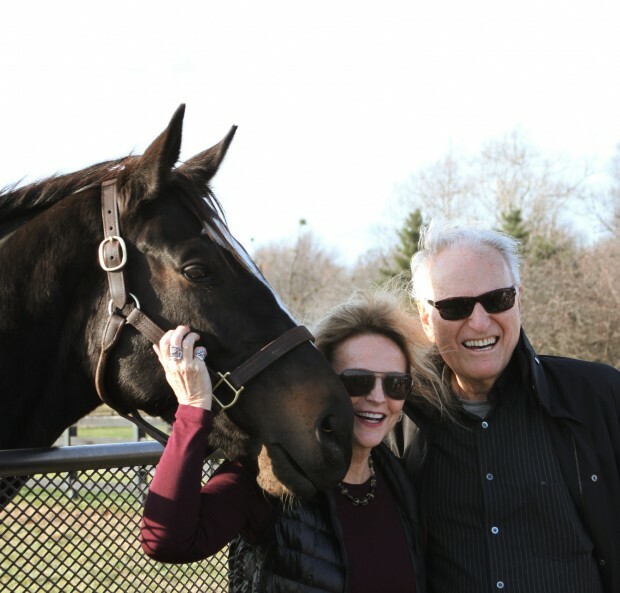 Ann and Jerry went to see Zenyatta and her colt with bags of carrots in tow. Both Z and her son are doing well, enjoying the crisp Kentucky fall air. Zenyatta is healthy and happy, and 12Z is growing fast! facebook is a medium for plagerism, inaccuracies and fictitious information. to make them come true and to mislead others when it only creates fiction, dissatisfaction and disrespect to those who are actually involved as you pointed out. Thanks so much for your candid comments. I’m not sure why you think Facebook is any different from any other print medium that invites comments from anyone who chooses to make them. Of course the privilege of free speech can be abused, and the medium can be used to promote inaccuracies as well as hurtful comments, but it’s the people who post and read there who make the difference – not the medium itself. There are many good things that have resulted from Facebook (ask almost any charity that maintains a page – including horse rescue operations – or families who use it to keep in touch over long distances). The sweeping indictment simply isn’t warranted. THE WORLD IS NOT ALWAYS SEEN THROUGH ROSE COLORED GLASSES !!! looks like it has hit the Northeast. Bundle up, light a fire and enjoy !!! Have a Great Holiday !!!! Sign, you failed to address the very good points Sandy was making here, and your tone of talking down to her raises my blood pressure. So does your overuse of capital letters. Remember, a little goes a long way. Happy ninth wedding anniversary to Dottie and John Shirreffs today! YAY! Happy Anniversary, Dottie and John!! Trina. Thanks for the reminder. Many good wishes to John and Dottie on their special day. A day late but sending Best wishes to you both. A defense mechanism that allows people who aren’t comfortable being openly aggressive get what they want under the guise of still trying to please others. They want their way, but they also want everyone to still like them. Are you working on your autobiography, Sign? Sign, thanks for the snowy Clydesdales. Miss them and the frog commercials, too. What a crack up, right Trina? Terry Crow, thanks for the jokes-I think! LOL. Happy high hoof anniversary to Dottie and John!!! We hope to visit Rightful Image this weekend–depends on weather. Perhaps more rain and it has been cold and windy, for us here. We would like to give him a Second Place Carrot to wear around his neck. Mike said he came out of the race in good shape. Hey Terry, here ya go: in my wing at work it is usually rather cool. We dress in warm attire. Recently the ladies room there has become HEATED! So now, for more than one reason it is a pleasure to go in there. A co-worker and I were discussing of perhaps moving our work in there for the duration of this cold spell. But since our bosses are men, guess not. Sigh. Right, Anne! Glad to hear Rightful is doing well after his race. High hoof to him, and I hope he enjoys that carrot! you can. Please do keep us posted on Rightful’s future races. We are so proud of you. Rightful! Give that horse a Stout! Stay warm…if you ladies take over the bathroom,you could dub yourselves,The Royal Flush! Anne-Always a pleasure to hear from you as you are one of my favorite people on the blog. Your comments make sense to me. I do some of my best work in the outhouse..
JudyB. I love all cows. Moose and Goose are great names for these girls. As I recall, they are Holsteins, very lovely bovines and so chic in black and white. However, other varieties such as Jersies are very nice too. Max, I will round up some red bows today. Yes, they are chic Holsteins. The Jersey girls were very stubborn,some refused to move…so the Black and Whites prevailed. We had a show to put on! High hoof to the lovely showgirls, Moose and Goose! Keep those girls “a growing” for next year’s show. in the pasture with all their friends at christmas. Thank you, Lord, for being there for us in our times of need. Thank you, Lord, for taking the time to listen to us and care about what we have say. Lord, there are things happening around us that are difficult to understand, this makes us feel vulnerable. Even in the midst of this confusion, we know that you are the Lord. Wishing everyone a safe, prosperous and Merry Holiday. Look at him stretching those legs…………..brilliant! He is an amazing, guy. Wish we could have seen him in the flesh. his races as he matured as a 2, 3 and 4 year old. DAILY RACING FORUM: LITTLE MIKE TO DUBAI TO TRAIN ON THE TEPETA. Golden Gate Fields is the only other track I know which has a Tapeta surface. Maybe he should just take him there to see of he can handle it. Would be a lot cheaper !!!! Sounds like Dale Romans is on a roll. Many of you might have heard this story from Newtown, but I wanted to post it here for those who did not. Except for the longer coat, these puppies look like our dear Charlie. Enjoy. HAPPY ANNIVERSARY, John and Dottie!! Hope youhave many, many more and oodles of wonderful memories. I am glad those dogs can be there to help. Thanks,Barbara…give your Charlie a big ole hug. Those dogs always manage to find that hand,dangling from a nap time couch,searching for love! They are great friends! Watched these loving comfort dogs with the children, it was so special. You are blessed to have Charlie in your life. Barbara-Thanks for forwarding this. The quote is that there is nothing as good for the inside of a man than the outside of a horse, but I think you can include dogs in that category, too. Barbara. Wonderful post. I read in the English papers that each of the dogs has his or her own Facebook so that the kids, or adults, who meet the dogs at Newtown can keep in touch. Great idea. Wow! I didn’t know that. Thanks to all for the kind comments. Each dog has so much to offer if we only listen. Barbara. Here’s the link to the British article on the dogs. Lots of nice photos. Mentions the Facebook pages for each dog so that their new friends can keep in touch. Barbara. Got distracted by proofreading! Here’s the link. Thanks for the link to the additional pictures and information Max. This is an amazing program these people have put together. A very high paw to these canine bringers of comfort and their handlers. Thanks, Barbara. Thanks for the link to this great story Barbara. I had seen a fleeting mention of it on the news, but these pictures and the video are really heart warming. What a wonderful way to bring some comfort to the children (and everyone, really) of Newtown. So very special, dogs are so comforting to people. so very special. Great link to start the Holiday weekend. 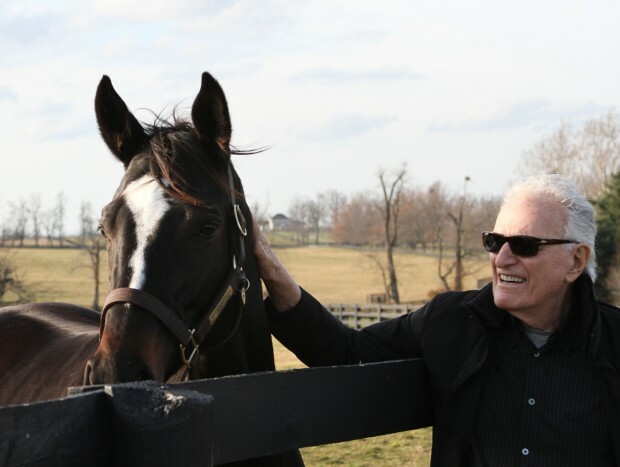 The Churchill Downs Foundation awarded a $10,000 grant to the Kentucky Equine Humane Center for general horse care. John Asher, Churchill’s vice president of racing communications, and Dana Johnson, Churchill’s senior director for corporate responsibility, visited the Equine Humane Center on Monday, Dec. 17 to present the check. 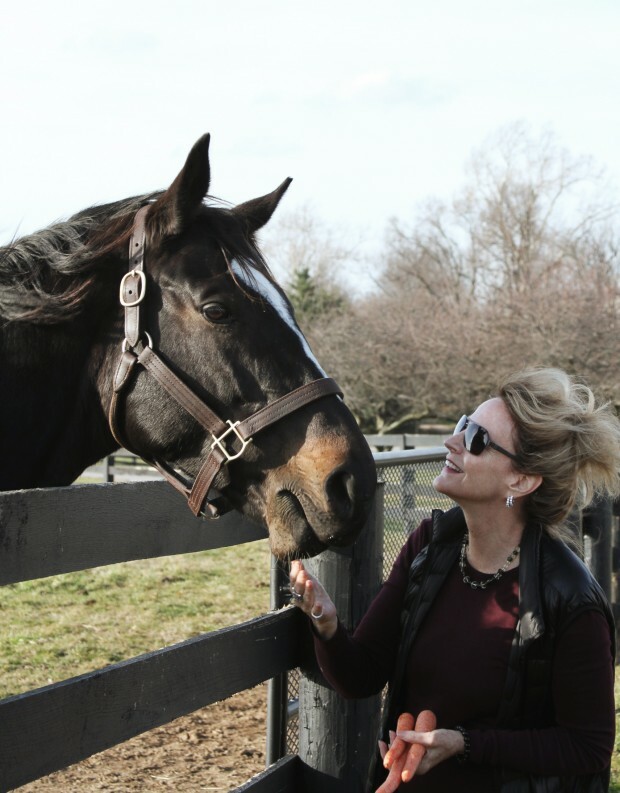 The Kentucky Equine Humane Center, located in Nicholasville, Ky., provides humane treatment and shelter while working as a clearing house to seek adoptive homes for Kentucky’s unwanted equines, regardless of breed. Saratoga maiden winner PARK CITY is slated to return to the worktab Monday with a breeze. Nashua S. 4th-place finisher DARWIN is sidelined & will target a BEL (Belmont) or SAR return. MENTOR CANE worked a high energy half mile. Hard to pull up on the gallop out. Jock R Napravnik off Wed with flu & is feeling better but still out 2day. Targeting Fri return. M Guidry, sick Wed, back 2day. for us today will take care of us tomorrow and every day. and our shield. Our hearts have trusted in Him and we are helped. BROUGHT ALL OF US TOGETHER. Happy Holidays to all and a blessed day. The above title may seem inappropriate to some. “Death is not funny,” they might think. The idea of laughing at a time of loss seems antithetical to the emotional upheaval the bereaved is feeling. Yet, for those who work in the field of laughter and humor, it is perfectly understandable to laugh at a time when you least feel like it. The healing benefits encompass body, mind and spirit and help to ease the pain. Each of us will be touched by grief. It might be our personal journey through a death, divorce, serious illness or any other type of loss. Perhaps a friend or family member is grieving. We may be asked to speak to a group that has experienced a tragic loss. When giving a general presentation, it is important to recognize that at any given time there could be audience members who are privately grieving. Benjamin Franklin wrote, “In this world nothing is certain but death and taxes.” While we cannot help others with the pain of paying taxes, we can assist them through their grief. Why laughter? If laughter is the best medicine, then is there anything that cannot be eased by using it? When a person is grieving several symptoms are common. Their immune system is suppressed. We are all aware of the ways in which laughter can help to boost the immune system. Another common trait is the difficulty in concentrating. This is a great gift when someone is faced with a loss. We could not function if we were to face the enormity of the loss all at once. So, the brain slows down and lets the reality creep in little by little. This process could take weeks, months or even years, but the slow recognition of how life is now forever changed is part of the natural process. This also means that the bereaved live by Post-It notes. Simple tasks are forgotten and they rely upon taking copious notes to remind them of the tasks of the day. Many people have found themselves at the grocery store in tears because they cannot remember what they went there for. Again laughter can help with brain function and memory retention. Stress levels rise, sadness and depression increase and it becomes difficult to find joy for even a moment. Erma Bombeck’s words, “If you can’t make it better, you can laugh at it,” exemplifies this attitude. Some people find it difficult to laugh again. They may want to, but do not find anything funny. Others may find it objectionable to laugh at such a time. One woman found that others stopped offering her comfort as they took her laughter as a sign that she was fine. For many guilt accompanies those moments when they experience happiness again. Living with loss can be a very contradictory experience. NANCY WEIL is serious about laughter. She developed the LAUGH ACADEMAY. After receiving her certification as a laughter leader, Nancy made it her mission to let others know of the tremendous benefits of laughter. Today, she is a sought-after lecturer, presenting programs and seminars to a diverse audience. Nancy enlightens her clients on how laughter and humor can be used to ease suffering and enhance one’s life. Nancy works at both Mount Calvary Cemetery and the Catholic Diocese Cemeteries, where she serves as Director of Grief Support as well as a Certified Grief Management Specialist. I didn’t realize John S was upset about “E”‘s Facebook page and it’s inaccuracies. (And I totally understand why) However given the chain of events recently in my beautiful state of CT, I hardly think that a little msg from E on a social media outlet is not so bad. Life is too short to get upset about something you have no control over, and I am sure a fine man like John S would agree with that. I logged onto this site the other day in hopes of a smile or a fun video or a kind word, and I got exactly what I was looking for! I will take solace that whoever wrote “E”‘s facebook msg did not mean any harm, unlike the people who are trying to profit off a horrific tragedy by setting up fake facebook pages and scams for money. who pull us away from that mindset and add laughter to our lives. Wishing everyone a laughter filled Christmas holiday !!!! ‘champion’ may produce a champion as both are untested. and unproven stallion at the time, Street Cry, was another approach. Happy Anniversary John & Dottie !!!! Ann & Jerry – The pictures are Amazing – you both look so happy when you are with Z & Baby ZB. Are there any pictures of John & Dottie with Z And Baby ZB to post? – would love to see pics of John with Z. Happy Holidays & Happy New Year to all !!!!!!! How much would it cost to go visit Zenyatta at Lane’s End? It’s me dream to personally meet this mare after I graduate high school. Thanks!